An everyday 2 way foundation that works so well for me, I don’t even look at any other brands in the pharmacy anymore. Get it when it goes on sale and best of all, it comes in refill pans so you save even more. Read the original review here. Yet another everyday powder I love for its (almost) flawless skin effect that it gives me. I’m on my 2nd pan already and I love travelling with this one, because it gives me a slightly better finish than Revlon but is less fragile than travelling with the Splurge option of Shu Uemura! Read the original review here. Definitely a splurge, but one that is ultimately worth it (for me). I use this one on days when I want a powder foundation finish that will last on me, and that gives me crazy flawless skin on which to build the rest of my makeup. Also one I use when I have to impress 😉 Original review is here. 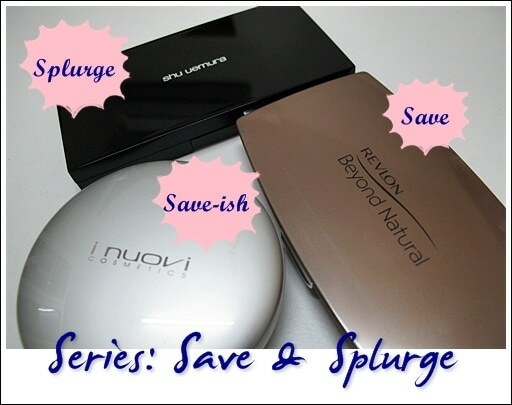 Save and Splurge is where I show you 2 similar items by 2 different brands that I have tried. They may not work quite the same way, but it’ll offer you options for your wallet for a similar effect/product. Do note however, that it is based on products I have tried, so whilst there are many save and splurge options out there, these are my views. You can find more under the category of Challenges. Availability: Revlon at most major pharmacies, I Nuovi at Sasa, selected Parkson stores and the I Nuovi boutique, and Shu Uemura at most major department stores and the Shu Uemura boutiques. Its definitely a splurge but as I noted in my review of the Shu powder, I prefer Shu Uemura because the color match is better. P&J was a touch pink for me. Now, I’m using MAC Studio perfect NC42 (RM35 case and RM125 foundation) Totally happy with it and it doesn’t breakout on me. It went okay when I’m flushed from the heat and I get a lot of compliments (and appreciative stares) which is very rare especially since I only wear the powder and a gloss for university. So far, I’m now willing to splurge more on foundation. Its really a good investment; I could always go to pharmacy for blush, eyeshadow and lipsticks but not foundation.. No-no! out of the 3, i only got Shu’s. That’s like love! It last even I got pretty oily skin and yes it gives a very nice flawless look! And I think as the day goes by, the foundie actually looks better! Definitely splurge on foundie cuz it either makes or breaks ur makeup! Bought the I Nuovi one recently at their sale but am yet to try it out (thanks to reading reviews like yours)! So far, ZA’s 2-way foundation is working wonders for me. I am very much a fan of liquid foundations, but have gotten lazier since I switched to powder foundations. The Revlon one is damn expensive though for a drugstore brand. But their Colorstay liquid foundation is the love! Am trying a make-up diet for my face by using tinted moisturiser more often. Haha. I don’t know if the Shu Uemura foundation will break you out. Some people have reported breakouts but a lot depends on your skin and you can’t tell till you try it unfortunately. My vote goes to LAura MErcier…!!!! Hmm… I haven’t tried Laura Mercier foundations though I’ve heard a lot about their tinted moisturizer. Perhaps i should give it a go even if tinted moisturizer isn’t quite my thing LOL! A friend tried Chanel but didn’t think it all that great. I’ve tried a Chanel powder foundation but it turned me orange so I’m not so keen on trying again! I love Shu Face Architect. I have not used drugstore powder foundations in a while, so I cannot comment what they are like these days. But I’ve read some good things on the L’Oreal one (think it’s True Match?). This post is useful as I’m still on the lookout for the best foundation for me, and it’s good to have a summary of what has worked for you from drugstore to a higher end brand. Glad to know you found this one useful 🙂 I only picked the ones I liked from each category – guess my perception might be a bit skewed in terms of prices LOL! I think the L’Oreal powder is a bit thick to start with but staining is a pity! Better avoid white clothes while wearing it eh? what about maquillage powder foundation? which one give better result? I’ve never tried Maquillage foundations so I can’t compare. Thanks!